It's tiramisu. And it's an easy-to-make pie. 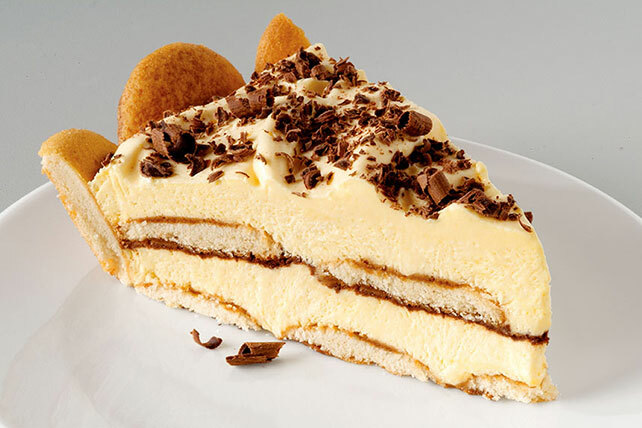 This delectable dessert sports layers of creamy pudding and delicate vanilla wafers all drizzled with coffee. Arrange 36 wafers on bottom and up side of 9-inch pie plate. Drizzle with 2 Tbsp. coffee. Beat cream cheese in large bowl with mixer until creamy. Gradually beat in milk. Add dry pudding mix; beat 1 min. Gently stir in COOL WHIP. Layer half each of the pudding mixture and grated chocolate in crust; cover with remaining wafers. Drizzle with remaining coffee. Repeat layers of pudding mixture and chocolate. Refrigerate 3 hours. Enjoy a serving of this rich and indulgent treat on special occasions. It's sure to be a hit with family and guests alike! Place measured amount of cream cheese in microwaveable bowl. Microwave on HIGH 10 sec. or until slightly softened. Prepare using JELL-O SIMPLY GOOD Vanilla Bean Flavor Pudding.